Prairie Nutcracker Tickets Available October 2019! 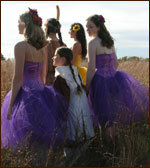 Prairie Nutcracker performs the second weekend in December in odd numbered years. Friday, December 13, 2019 7:30 p.m.
Saturday, December 14, 2019 7:30 p.m.
Sunday, December 15, 2019 3:00 p.m.
Tickets will be available online at prairienutcracker.com, at ArtisTree, and through the Fox Theatre Box Office beginning October 2019.